Happy Friday to you all … hope you are enjoying this weather! How nice it was to come home from Convention knowing that the oppressive heat you had was gone. Sorry you had to go through that! Today I’d like to share with you a simple and “quick to make” Birthday card. It seems we always need birthday cards. Don’t you find some months are loaded with birthdays? April and September are big ones for me. I also have some stampin’ tips for you to use while making this card. First, we will be using makers to color our stamp, which comes from the stamp set “Delightful Dozen”. 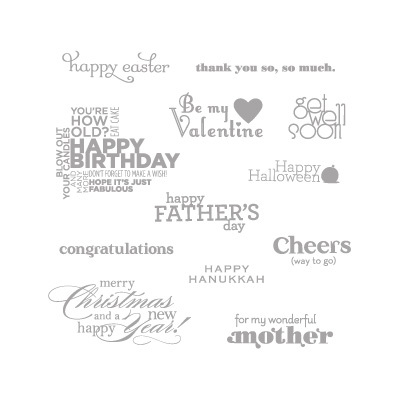 Any birthday set would work for our card, but I like the Delightful Dozen because it covers so many occasions… great for new stampers, or anyone who likes to get a lot of use out of there stamp sets. 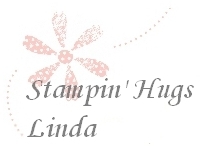 OK … back to our stampin’ tip! 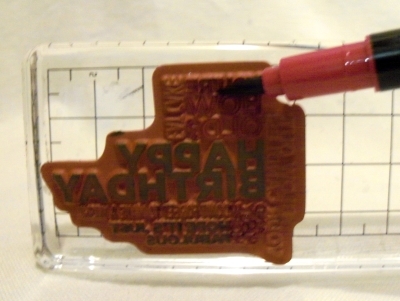 When coloring your stamps (known as Direct to Rubber Coloring) you will want to keep the end of your markers as flat as possible, not directly coloring with the “tip”. Coloring with the wider section and not the very tip, will keep your markers lasting longer. Oh yes, and when using multiple colors … start with the lightest and work your way to the darkest. Here I used: Summer Starfruit, Bermuda Bay, and Rich Razzelberry. My second tip is how to create “flags”. You can easily get that perfect end by using your square punch. 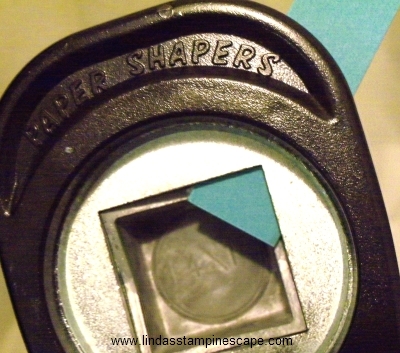 Begin by sliding your cardstock into the punch and line up the corner of the punch to the center of your cardstock. Then, make sure both sides of the cardstock are even (it will look like a house). It’s really all in the alignment, and simple when you get the hang of it. Just a little practice and you’ll be on your way to perfect flags (or banners as some call them) either way … they’re HOT on cards right now. Now on to the card …. Now … isn’t that cute! And so easy, just use DSP (Designer Series Paper) a couple of scrap pieces of cardstock – punched to create flags, and a greeting! Who doesn’t love simple and fast cards?! The birthday greeting was punched out using the 2-1/2″ (120906) Circle punch. I also punched out 2 Bermuda Bay circle to add a pop of color behind the greeting. You will notice it doesn’t go all the way around (because it’s the same size) but it’s just enough color to add a bit more dimension. 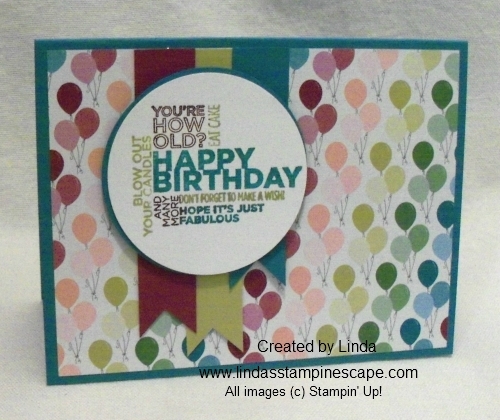 I used the fun, fun, fun, “Birthday Basics” (130145) Designer Series Paper. If you think it’s cute in the catalog, wait till you get it in your hands! Oh my gosh … I fell in love with it. With 10 grandchildren, this will really come in handy. Please don’t forget that the Designer Series Paper is currently on sale … Buy 3 / Get 1 FREE! (Sale ends July 31st). Let me know what you think of this paper. Do you already have it already? Let me know by dropping a line in the comment box. Thanks! « A Paper Pumpkin video and more!